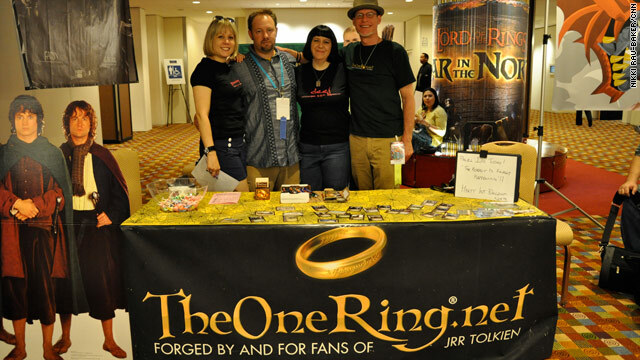 The three panels on “The Hobbit” at Dragon*Con, all presented by The One Ring.net, were a fan force to be reckoned with. And that’s not surprising, considering how TORn is the dominant entity that has united Tolkien fans. It was standing room only over Labor Day weekend at Dragon*Con as we filed in to learn more about the films and it's tumultuous journey from page to screen. Since last year’s announcement of a greenlight for “The Hobbit” one place people have been flocking to for information is TORn. TORn is the premiere Tolkien related website. It was founded in 1999 and has been on the leading edge of LoTR film information since the first casting rumors were heard. Initially TORn was a fringe website in the world of Tolkien and Peter Jackson, but has grown so much in influence and reputation in the last decade that when the studio photo of Thorin - a major dwarf character in “The Hobbit” - was released, it was sent to TORn first. TORn staffers have been traveling to the various comic book and sci-fi/fantasy cons this year, giving fans the latest information on “The Hobbit” from casting, to release dates and special messages from Guillermo Del Toro and Weta Workshop. The Lord Of The Rings director(s), actors and special effects artists all have visited TORn at one point or another, solidifying it's place amongst Tolkien enthusiasts as a “go-to” site for not only movie news, but trivia, meetups (known as moots, a reference to a meeting of The Ents of Middle-earth) and to generally share their love of Tolkien. Since 2007 people have been speculating, postulating and dissecting every bit of information gathered on over 200 pages worth of posts on "The Hobbit" alone. The road to making "The Hobbit" has been a long one. Peter Jackson said, “Let’s not shut down The One Ring just yet,” in 2004, giving us a clue that the director wasn’t done with his foray into Middle-earth. Fast-forward six years to 2010: casting for “The Hobbit” had begun and the film had a tentative greenlight. Here’s a rundown of how the movie went from just an idea in 2005 when fans were wearing buttons that said “Make The Hobbit Happen” to the first shots completed in 2011. 2006 – TORn received a letter from Jackson saying he wouldn’t be involved in “The Hobbit” due to a legal dispute with New Line Cinema. TORn fans were shocked given that Jackson had intimated a couple of years earlier that he would be pushing on with "The Hobbit". 2007 – MGM takes on The Hobbit from a financial standpoint and mentions Jackson as the Executive Producer. 2008 – Warner Bros absorbs New Line Cinema and hires Guillermo Del Toro as director. Del Toro is interviewed by TORn about his plans for the movie. Reaction from fans is positive as Del Toro has a great eye for fantasy. 2009 – A lawsuit with the Tolkien estate regarding royalties going back several years is resolved, giving hope that a greenlight and filming is around the corner. 2009/10 – Del Toro steps down as director, citing too many delays caused by MGM financial troubles. All MGM films put on hold, including The Hobbit. The TORn message boards are burning up with speculation as to who will be taking the helm after Del Toro stepped down. Of course Jackson is mentioned as a front-runner from the start. Spring 2010 – An announcement that Jackson will return as director for The Hobbit is made and the film is given a greenlight. The fans were elated as they hear that the man who first brought them to Middle Earth was back at the helm. Fall 2010 – A fire at a warehouse that stores several miniatures that were to be used in filming is destroyed. Along with that, New Zealand unions threaten strikes, which would delay shooting even more. An agreement with the unions and the NZ government is reached and casting is done. TORn fans around the world rally together and spread any information they come across on the message boards and live chats. 2011 – Warner Bros reaches a distribution deal with MGM, giving Warner Bros sole distribution rights. March 2011- Jackson and crew step onto the set and the first scenes are shot. Jackson continues to update TORn and the world with his video blogs chronicling filming. Summer 2011 – The Dwarves are revealed in small groups, the final dwarf (Thorin) being revealed on TORn. The main page features a poll asking fans what they think; the overwhelming majority agrees that the Dwarves look great. - The films are being shot with the latest Epic RED 3-D Cameras, shooting at 48fps, twice the speed of standard film. - Fifty-four days of principle photography on the first movie titled “The Hobbit: An Unexpected Journey, has been completed and is slated for release December 2012. The first film is expected to be shooting for an astounding 254 days. Peter Jackson is known for his lengthy shoots and The Hobbit is no exception. - For the first and second films Andy Serkis is taking on the challenge of Second Unit Director in addition to his role as Gollum. The second film; The Hobbit: There and Back Again, will be released December 2013. - Many familiar faces are making a return in both on-screen and off-screen roles. Richard Taylor is heading up Weta Workshop and Howard Shore is composing the soundtrack. Fan favorites Sir Christopher Lee and Orlando Bloom will be reprising their roles in the films. It was announced at a recent panel that Ngila Dickson; lead costumer from The Lord of The Rings, will not return for The Hobbit. A collective moan of sadness could be heard throughout the room as people shook their heads at the news. - Weta Workshop General Manager, Tim Launder, sent along a special message with TORn staffers to con attendees stating that they wished they could be there, “perhaps next year” giving us a hint that we might see some sneak peak footage early 2012. - During one of the panels we learned that several of the places in Middle Earth will be studio sets, but Hobbiton, which was created in New Zealand, will be used once again and the TORn panelists were told that October 3rd through November 8th the location will be closed to tourists, which would indicate that shooting for those scenes will be done at that time. There is plenty more to be discovered and discussed about these films so tell us, what are you looking forward to seeing in The Hobbit? EXCITED ABOUT THE WHOLE THING! I can't wait for this movie to be out. Peter Jackson, Weta, and the cast will do a great job for the fans again, so it's worth the wait. Fans of Howard Shore's music for the films might enjoy the book "The Music of the Lord of the Rings Films" by Doug Adams. There's a CD that accompanies it as well. It's an analysis of the film score but it is written so well you don't need a degree in music composition to understand it (plus the CD helps, you're reading about certain passages while listening to them). The artwork is great too. Ah, never mind. Looks like the Del Toro reference was revised. Er, Del Toro didn't direct any of the Harry Potter movies. You're probably thinking of Alfonso Cuaron. Also, I wish more journalists would learn how to spell Middle-earth (hyphenated, lowercase "e"). It's a nitpicky point, sure, but not using Tolkien's spelling just makes it seem like one has not done very much research. Good article otherwise. Wish I could have been at one of these panels. Very much looking forwrad to these movies. Thanks for your comments Eric! There were some notes that I had forgotten to revise and they made it into the first publishing, good eye. I apologize for the lack of lowercase e that you desired for Middle-earth. Cheers!